In our last post I talked about our day on Key West. With my work schedule we were able to spend another two days in the keys exploring before needing to head back north. Both days we slept in and had a lazy morning before heading out on our adventures. One of the first places we explored was the 7-Mile bridge. Yes, to the South/West of Marathon key there is a bridge that spans 7 miles between US-1 milemarkers 40-47. The original bridge was built by Mr. Flagler’s men as a railroad bridge, which carried the first train into Key West in 1912. The bridge deck has been revised a number of times since then, but the original structural arches remain. 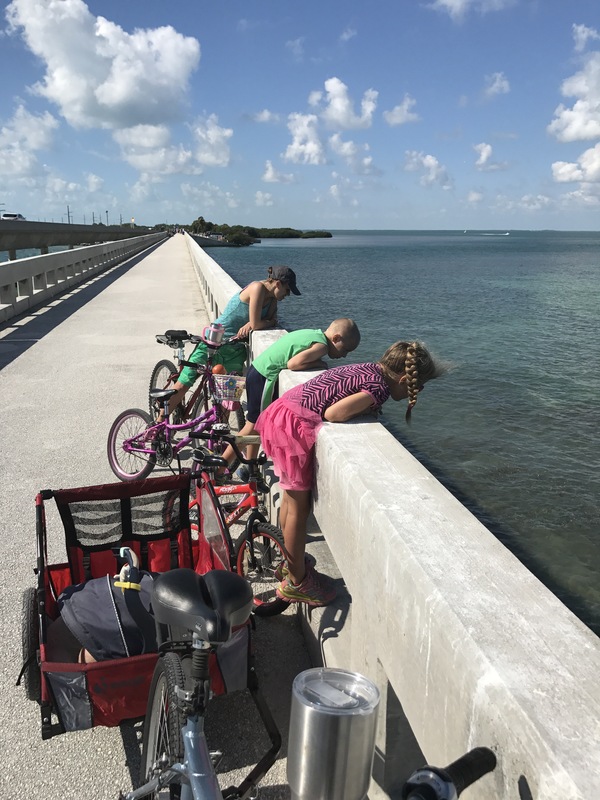 It is currently being used as part of a walking/bicycle trail that, once completed in a few years, will span the length of the keys. 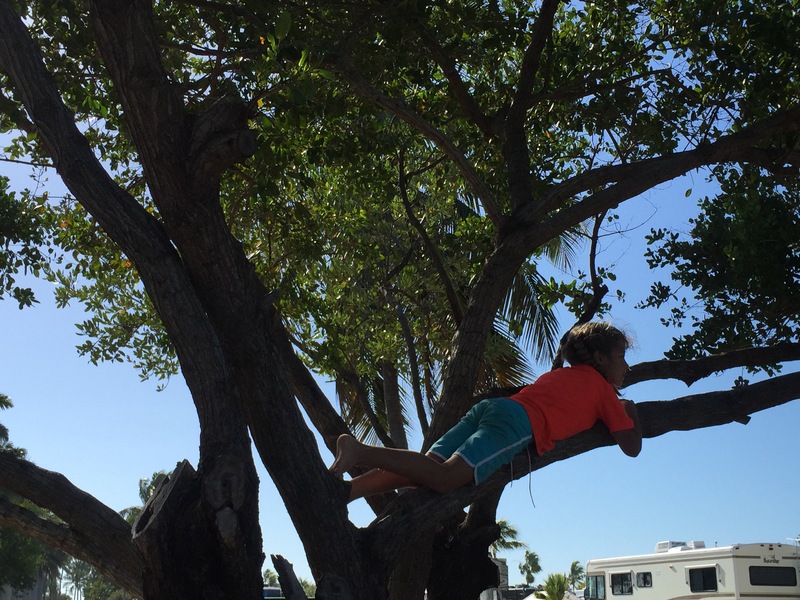 We explored Marathon Key and went to Veterans Memorial Park & beach. Vets Memorial park has a dog-friendly beach so our four-legged family member was able to come along. Dixie really enjoyed being on a long tie-out and went bounding through the waves along the beach. After a bit we decided to walk the length of the beach and started seeing…Man-of-war jelly fish. With a dog and two small children running around, this was a buzz-kill for us. We explored farther north/east along US-1 to another public beach, and were again greeted by Man-of-War jellyfish. 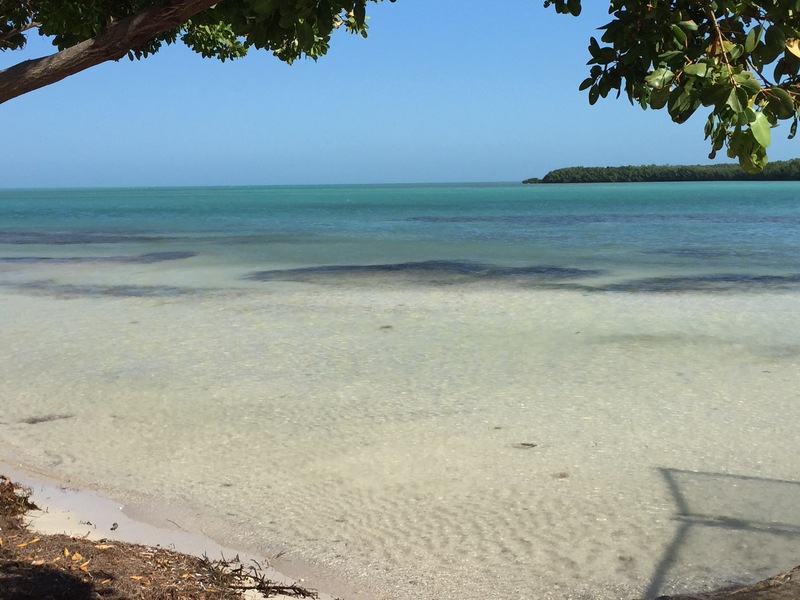 Since both of these beaches were on the windward side of the keys we decided to return to the campground, which had a leeward beach, out of the path that the jellyfish would be blown up onto the beach. I took a good look up and down the beach and did not find one. Hurray, we were safe to play! The kids dug in the sand, waded in the shallow water, and explored as close as we allowed to the historic train bridge along the side of the beach. They also climbed the trees that shaded part of the beach. I was amused when they decided to “heal” the trees by putting sand over where there was sap coming from the trees. The sand stuck to the sap and created a “band-aid” according to the kids. Heather and I enjoyed our time at the beach both in the water and swinging in a hammock strung between the trees. The campground had a very nice pool, complete with tiki hut shades over the poolside tables. There were plenty of lounge chairs to relax and catch some sun as well. We also took an interest in the local iguana that scampered from one end of the pool deck to the other and then back again. 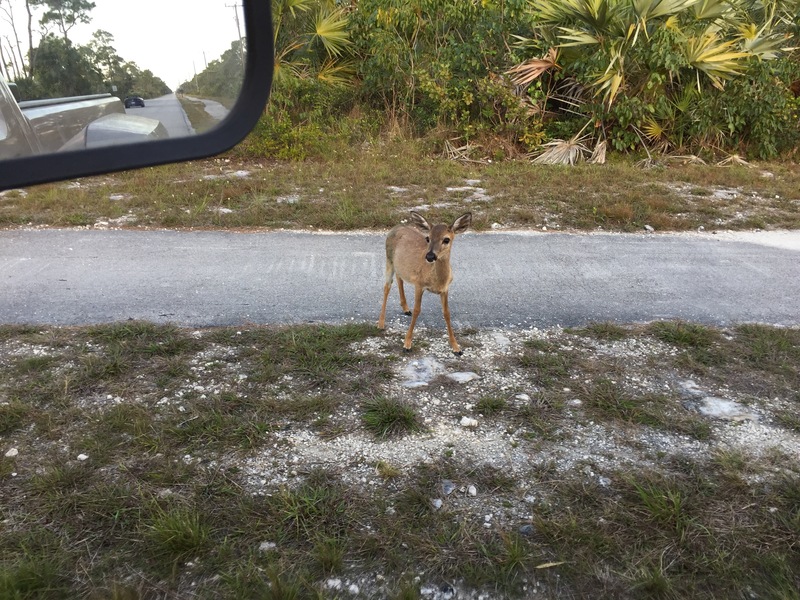 The Keys are home to many animals, including a special breed of deer called Key Deer. They are found ONLY in the Florida Keys, and more-so in the middle and lower keys. These deer are small, only slightly bigger than our dog Dixie. Since they are endangered, and therefore protected, they are not afraid of humans like other deer. They will walk right up to you. We visited the National Key Deer Refuge a few minutes west of our campground to see these little creatures. We took a walk around a nature trail and saw not only deer, but also alligators, iguanas, fish, snapping turtles, and one very pretty crab. 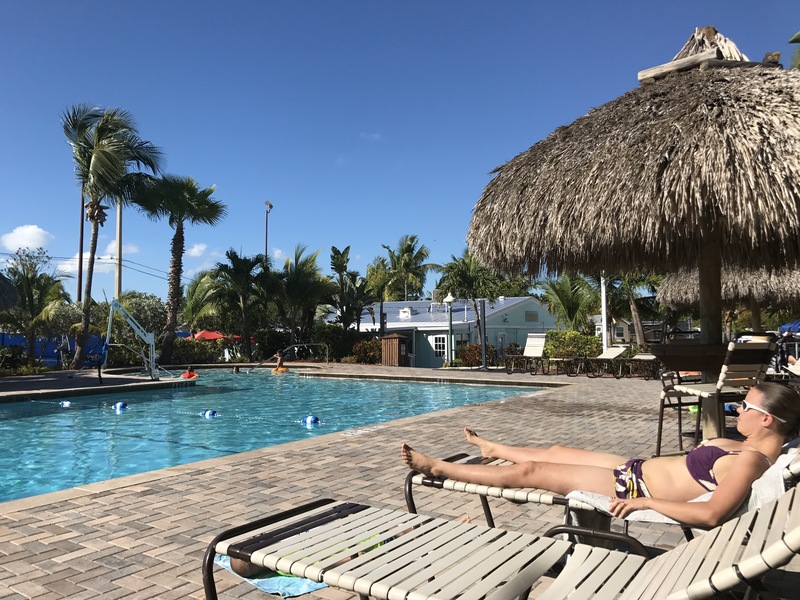 If there is one piece of advice that I would give to someone coming to the Keys, it would be to slow down and enjoy yourself. Once you leave the mainland the speed limit on US-1 is 45mph, with a few sections of 55. The road is typically one lane each way, with few opportunities to pass. Therefore, don’t be in a huge hurry to get somewhere. Just go with the flow and you are on island time now. We also followed this principle by not over-booking our visit. Instead of rushing from one place to the next, we had a list of things we wanted to do (mainly on Key West) and we had completed the list by the middle of the second day. That left half our visit to just explore and relax. As we headed north we had a pretty good tail wind, which then transitioned to a side wind and finally a headwind as we crossed back across the Everglades enroute to Largo. The RV and truck handled it well, although driving a large truck and trailer straight into a 30mph headwind burned some extra fuel as compared to the way down. In any case, we made it back to Largo and got backed in to our spot before nightfall. We even got new neighbors on the site right next to us. The really crazy thing is that they recognized us from the Keys! That’s right. Our new neighbors, another Fulltime RV family, had stayed at the same campground in the Keys and they recognized our RV from our mutual stay down there. Imagine the odds of that happening. Previous Previous post: Key West!